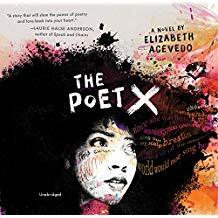 School Library Journal School Library Journal | The Poet X. School Library Journal | The Poet X. The Poet X. 3 CDs. 3:30 hrs. Harper Audio. Mar. 2018. $22.99. ISBN 9781538500231. digital download. Gr 7 Up—That Acevedo narrates her debut novel in verse is a sublime gift. She's undoubtedly the ideal aural arbiter of her spectacular coming-of-age tale about a Harlem teen whose generational, cultural, religious, and emotional conflicts coalesce to teach her "to believe in the power of [her] own words." Not yet 16, Xiomara is unlike her brilliant, never-gets-in-trouble twin brother: "He is an award-winning bound book,/Where I am loose and blank pages." She fills those pages with everything she can't say, revealing doubts, aches, secrets: "It almost feels like/the more I bruise the page/the quicker something inside me heals." She's not devout like her immigrant mother or her best friend, and she's hidden her maturing body for years, until that first kiss: "He is not elegant enough for a sonnet /too well-thought-out for a free write,/taking too much space in my thoughts/to ever be a haiku." Encouraged by her English teacher to claim her voice, Xiomara's performance of her verses will be "the most freeing experience of [her] life." VERDICT Libraries should prepare for eager audiences requesting multiple formats. Patrons who opt for the audio format can access Acevedo's additional explanatory track about a final contrapuntal poem.